"My daughter is 24, my God, she's only 24!" cried Beatriz Pantoja, whose daughter Leticia was on board the plane. Pantoja and other family members were rushed to a private area inside an airport terminal in the afternoon. The U.S. State Department is working to confirm if there were any U.S. citizens on board. Argentina's Foreign Ministry says two of the South American nation's citizens died in Friday's crash of a passenger jet in Cuba. A ministry statement says Argentina is "deeply shaken" by the deaths. A statement from the country's Transportation Department identifies the pilot and co-pilot as Capt. Jorge Luis Nunez Santos and first officer Miguel Angel Arreola Ramirez. It says the flight attendants were Maria Daniela Rios, Abigail Hernandez Garcia and Beatriz Limon. 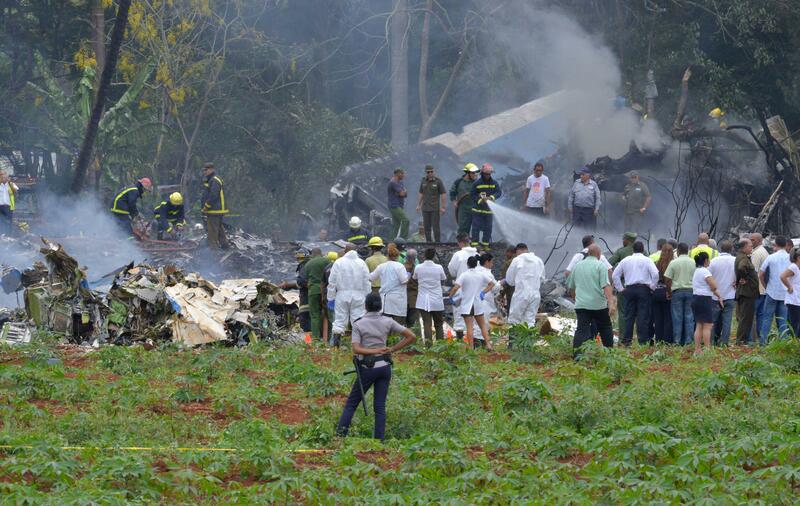 It adds that the plane was rented by Cuban state carrier Cubana de Aviacion from Aerolineas Damojh. That's the legal name of a small charter company that also goes by Global Air. Relatives of passengers rushed to the scene, among them a man who said that his wife and niece had been on board. He declined to provide his full name before he was taken to an airline terminal where relatives were being asked to gather. A military officer who declined to provide his name to reporters said that there appeared to have been only three survivors in critical condition, but other officials declined to confirm that figure. Cuba's First Vice-President, Salvador Valdes Mesa, met Thursday with Cubana officials to discuss improvements in its heavily criticized service. The airline is notorious among Cubans for its frequent delays and cancellations, which Cubana blames on a lack of parts and airplanes due to the U.S. trade embargo on the island. The crash Friday was Cuba's third major fatal accident since 2010. Last year, a Cuban military plane crashes into a hillside in the western province of Artemisa, killing eight troops on board. In November 2010, an AeroCaribbean flight from Santiago to Havana went down in bad weather as it flew over central Cuba, killing all 68 people, including 28 foreigners, in what was Cuba's worst air disaster in more than two decades. Cubana's director general, Capt. Hermes Hernandez Dumas, told state media last month that Cubana's domestic flights had carried 11,700 more passengers than planned between January and April 2018. It said that 64 percent of flights had taken off on time, up from 59 percent the previous year. "Among the difficulties created by the U.S. trade embargo is our inability to acquire latest-generation aircraft with technology capable of guaranteeing the stability of aerial operations," Hernandez said. "Another factor is obtaining part for Cubana's aircraft." Cuba declared national mourning until May 20. Cuban Presiden Raul Castro, who is currently hospitalized while he recovers from surgery, "asked that his condolences be given to the families of the victims of the catastrophic accident," he said in a statement.